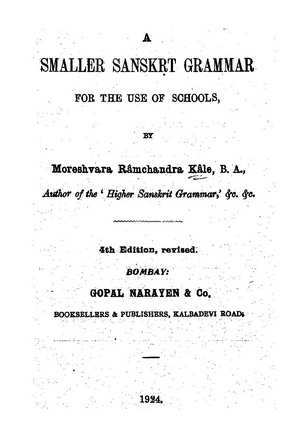 “A Smaller Sanskrit Grammar is specially intended for the Matriculation and the ordinary College students. Its plan of arrangement is the same as that of the ‘Higher Sanskrt Grammar.’ In it the more intricate rules and matter which was thought quite unnecessary for the students for whom it is intended have been omitted. The chapter on the Conjugation of Verbs has been almost the same as in the ‘Higher Sanskrit Grammar’, Frequentative verbs only being omitted. The last chapter contains but the commonest rules of Sanskrt Syntax. I was searching for this book. I am glad that I found it here. Thank you very much. Kindly give your valued comments on the same. I wish to improve my Sanskrit vocabulary and presentation skills. Thank you I am pankaj and started learning Sanskrit can u tell me which books do i need to start from the basics i:e I just have done Sanskrit till Tenth. I need to be very good at sanskrit as i am going to take it as my Optional in UPSC/IAS. You may start with “Sanskrit Teacher“. Thank you for having huge collection of Sanskrit, I also want to learn Sanskrit but i don t know where to start with, The Sanskrit teacher is no longer available, so please tell me where to find the basic book for learning Sanskrit. I appreciate your great work. I loved reading everything you Mentioned. Please, who was born first: the Panini’s grammar or the grammar Greek? Within the grammar of Panini, who rises first: the verb or noun? Let me know if you are not able to download any other book, specifying the title of the book. Sir,want to learn sanskrit. please introduc me book. and where i bought it. can i download it from net. if book is avalable in market. suggest price and address. if by post send me. what have i do.please reply. You may also contact the nearest centre of Samskrita Bharati organisation. They conduct correspondence courses for beginners and also ‘Sambhashana Shibira” wherein one can learn to speak Sanskrit.